A snake in our hut! Our life in Kruger National Park. The story about the snake in our hut took place when I was on trail with Steven a few years ago. But before I get to the snake part, I feel like a little background information about the trails might be nice… Walking trails are an amazing way to spend some time in Kruger’s wilderness areas. And one of my favourite things to do! Olifants Wilderness Trail (Stevens trail) is one of 7 wilderness trails in Kruger National Park. The trails last for 4 days and three nights and depart on either Sundays or Wednesdays. The trails ranger and his assistant meet their guests at Letaba where they load their luggage into the trailer. From Letaba, it is about a two-hour drive to the trails camp, which is located on the southern bank of the Olifants River. The no entry road into the trails area starts at Bangu windmill. We often see elephants and buffalo on the first part and giraffe and zebra a bit further in. The drive to the trails camp goes through four streams, which are mostly dry. They only flow after a nice downpour. Then after the last stream, it is only a few kilometres before the road makes a sharp turn to the right. You then go uphill until at the top of the hill the trails camp gate appears; guarded by an old elephant skull, a lion skull on the gate and a crocodile skull on the fence. The camp has a man high fence around it. Steven says that the fence is more to keep the tourists in than the animals out. Although I personally would not even think about going for a wander outside the camp in the middle of the night! The camp itself was built in 1979 as the second wilderness trail that opened. It is old, very rustic, but has tons of charm. 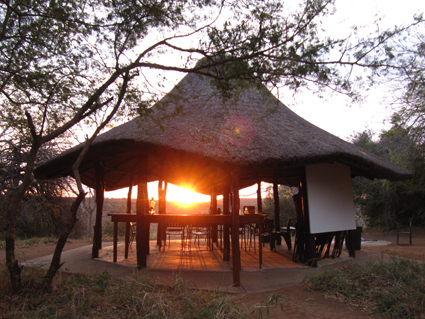 And the best for me is: it is right on the bank of the Olifants river. The views are stunning, the sound of the water calming and the sound of hippos calling really add to the feeling of being in Africa…. In camp, there are four A-frame huts with two single beds. There is a lapa, a kitchen and then there are also two flush toilets and two showers. There is no electricity or cell phone reception, which is sometimes disappointing to people, but we feel it adds to the wilderness experience. Upon arrival, which is always around sunset, there is always a nice fire going in the fire pit. 8 canvas chairs set up invitingly around the fire. Shadrach the cook is there to greet the guests and to help unpack the trailer. He is in camp long before the guests arrive in order to prepare the huts and to make preparations for dinner. Once the guests have settled into their huts, everyone gathers around the fire, where the kettle is always on. Steven then explains the program and a few camp rules. The program for the first two days is basically the same. Steven or his assistant wakes the guests up and puts some hot water in a bowl at each hut for everyone to freshen up. Especially in winter, this is so nice! It can get very nippy in camp, and sometimes that warm water is exactly what you need to get up and leave your warm cosy bed! Everyone meets at the lapa for coffee, tea and rusks and as it starts getting light, you leave in the cruiser for a drive to the walking area. There are no set times or distances for the walks. It all depends on what you see, what the weather is like and how fit the guests are. After the sun sets, it is time to go back to camp. And as you get close, you can already smell the campfire that is going and the food that is almost ready… such a spoil! The last morning, the wake-up process is the same. The guests have a chance to pack their bags, have a light breakfast and enjoy the sunrise over the Olifants River before it is time to head back to Letaba. Before the kids were born, I was fortunate to be able to join Steven on quite a few of his trails. This particular trail was in October and it was extremely hot, so we didn’t walk far that morning. We also did not see much; the animals were probably just as lethargic as us in the heat. I have to admit the summers in the lowveld (when things turn into slowveld in the heat) are hectic for me as a Dutchy. I am not used to temperatures that go well into the forties day after day, week after week. To be honest, I much prefer the winters here with cool mornings and nice and comfortable temperatures of mid-twenties during the day. I would actually go as far as saying that winters in the lowveld are nicer than summers in Holland…;-), but I am sure not everyone will agree with that! Anyway, after another one of Shadrack’s delicious brunches, the guests retired to their huts to have a bit of a siesta. Steven and I decided to do the same. We had opened the wooded flaps on both the front and the back of Stevens hut to let a bit of airflow through and to allow a tiny bit of a breeze if there ever was any. I always slept under a mosquito net. I don’t want to take chances with malaria (you can read about our experience with malaria here). Besides, the mosquito net also stops the droppings from the bats that were living in the walls of Stevens hut from falling on the bed. I don’t mind the bats in the hut, all the huts in the trails camp have a few or many; it comes with bush living. But I do think the bat droppings on my bed are a bit gross. It was extremely hot in Stevens hut and I struggled to fall asleep. I could hear the bats chirping and scratching around in the walls. I am sure they were just as uncomfortable as I was. By the sound of Stevens breathing, I could tell that at least he was in a deep sleep. The heat never bothers him too much. I woke up all sticky and sweaty because I needed to use the toilet, which is in a separate thatch structure next to Stevens hut, together with a shower. Steven had the shower wall taken out, so you could actually shower with a view. Great idea if you ask me! When I got back to the hut, Steven was on his feet, standing in the middle of the hut. When he saw me approach, he held out his hand, stopping me from coming in. He had been fast asleep a few minutes before. “What’s wrong?” I whispered. He never answered, he just pointed at the side of the hut where my bed was in the corner. I took a few steps closer, my eyes taking a few moments to adjust to the relative darkness inside. A metre above my pillow, a Mozambique spitting cobra had caught a bat and was trying to pull it up through the cracks in the wooden slats!! I had been sleeping there only a few moments before! As I got up to go to the loo, I never heard or saw the snake! I have never been extremely scared of snakes. They are quite interesting and respect that they can be dangerous, but I don’t know what I would have done if I had seen a cobra dangling a metre above my head! After the initial shock, it was actually very fascinating to see the snake slowly pull the bat up through the slats and manoeuvring it so he could swallow. It took the better part of half an hour. Especially the bat’s wings were a bit of a challenge. Both Steven and myself had to laugh at this poor snake. It now had the bat almost completely in its mouth but the bats wings were still sticking out on either side of its head! Eventually he had to bring up the bats body a bit, turn it around, and only then it went down. The only evidence left was a big bulge on the snake’s body. We figured the snake would make his way out of the hut and back into the bush, but I guess the snake was still hungry. It went over to the other side of the hut, where there were more bats living between the walls. As the snake was making his way towards the bats, we could hear them starting to panic a bit, chirping and scratching more and more as they were trying to escape from the approaching danger. They came from the cracks in the walls in big waves flying into each other and into us as they few out of the hut. One bat never made it out in time. And we watched in fascination as the cobra also swallowed this bat whole. The snake then left Stevens hut with two big bulges on his body. He probably did not have to eat again for weeks! Interested in how it all began? Read “the Ranger and the Flight Attendant” here. Loving this blog … thank you !! Live the trails Linda, done a few, but not Olifants yet. Thank you Kathy! Hope you like it! I’m loving your stories. I’ve just read your blog from the beginning and can’t wait for the next instalment. As a South African living in UK , you are making me feel at home again – thank you! Thanks for the lovely comment Marian! If you don’t want to miss any new blogs, you can sign up to receive and email every time I post one. The sign up form is at the bottom right of the page! That is quite a story. 🤣 Dramatic. Lucky your didn’t bump into it on your way out. Ja nee! It was amazing to watch though!